I want to ask about the controversy over your quotations in your songs from the works of other writers, such as Japanese author Junichi Saga's Confessions of a Yakuza, and the Civil War poetry of Henry Timrod. In folk and jazz, quotation is a rich and enriching tradition, but some critics say that you didn't cite your sources clearly. What's your response to those kinds of charges? Oh, yeah, in folk and jazz, quotation is a rich and enriching tradition. That certainly is true. It's true for everybody, but me. There are different rules for me. And as far as Henry Timrod is concerned, have you even heard of him? Who's been reading him lately? And who's pushed him to the forefront? Who's been making you read him? And ask his descendants what they think of the hoopla. And if you think it's so easy to quote him and it can help your work, do it yourself and see how far you can get. Wussies and pussies complain about that stuff. It's an old thing – it's part of the tradition. It goes way back. These are the same people that tried to pin the name Judas on me. Judas, the most hated name in human history! If you think you've been called a bad name, try to work your way out from under that. Yeah, and for what? For playing an electric guitar? As if that is in some kind of way equitable to betraying our Lord and delivering him up to be crucified. All those evil motherfuckers can rot in hell. I'm working within my art form. It's that simple. I work within the rules and limitations of it. There are authoritarian figures that can explain that kind of art form better to you than I can. It's called songwriting. It has to do with melody and rhythm, and then after that, anything goes. You make everything yours. We all do it. 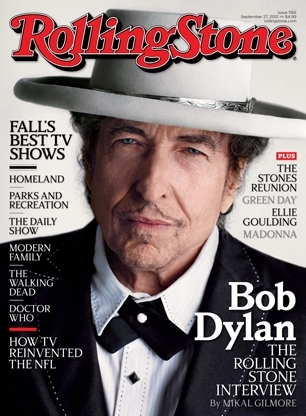 For the full interview, pick up the new issue of Rolling Stone.